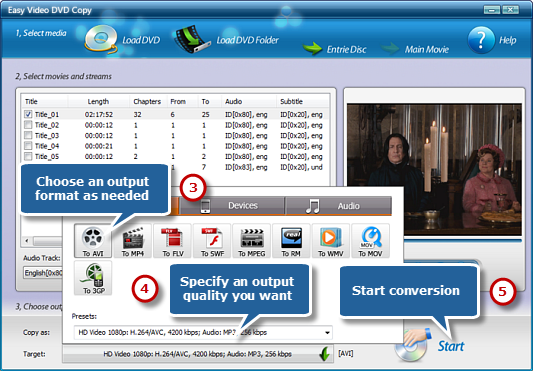 Easy Video DVD Copy is one of the most powerful, flexible and fast tool you can find for copying your DVD video to popular video formats. 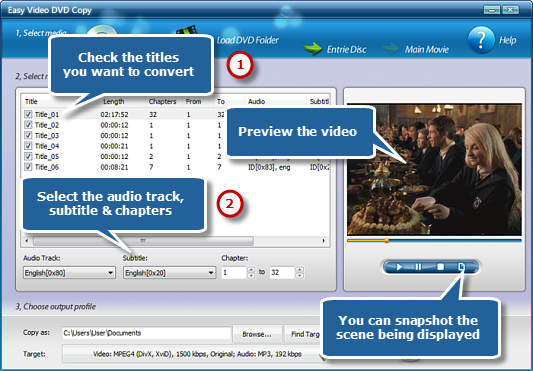 Now you can enjoy them with media player applications like Windows Media Player, QuickTime Player, RealPlayer, KMPlayer, etc. Also, the mobile playback on many devices like iPod, iPad, iPhone is much easier. Click “Browse…” to choose an output directory to save the converted videos. Activate the “Target” menu and it will display 3 tabs for output formats: Video, Devices & Audio. Choose “To AVI” from “Video” tab. For specific needs, you can adjust the output quality with the well-configured presets for every format in the “Preset” dropdown list. Then, click “Start” to start conversion.